The repository for miscellaneous artwork I have felt compelled, for whatever reason, to upload and show off. Some of it has nothing to do with the comic, some of it is just sketches or studies of TWB characters, a few are bits that were posted to be attached to a particular strip, and I linked it here so that you don't have to search through the Archives to find it. There will be no scheduled update here, something gets added pretty much whenever I feel like it. Guest Strips: Occasionally, if they ask nice, I've done guest strips for other comics. Guest strip for "No 4th Wall To Break". Poisoned Minds: "Mel" is the presumably-false name given by a lady that struck and injured PM's artist while he was cycling. The robot is one of his bad-guy characters called an "Inlay". As you can see, I can do robots better than people. I did this back in late '02 or early '03 as I recall. Miracle of Science: See here for the explanation. Sophisticated binoculars, in response to questions about this strip. 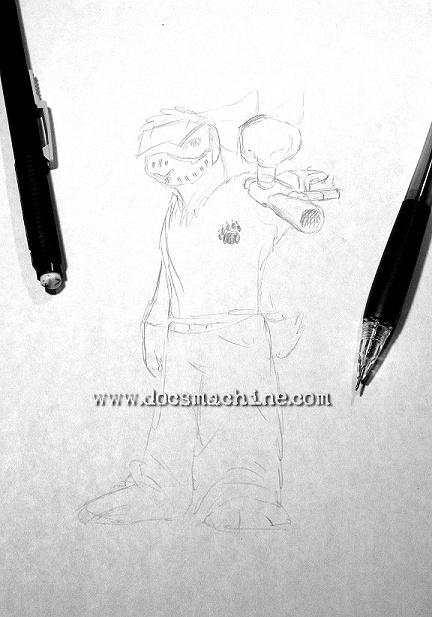 Early sketch for a proposed T-shirt design based off the popular "Gangsta" strip. Sometimes I put in extra comics on "off" days... sometimes I just yank readers' chains. Back by popular demand: Miss Sandy modelling the "Cheaters" Tee! And again, in the photo studio. ... And her response to Doc's spur-of-the-moment promotional offer. Quickie sketch, a still-life entitled, Polar Bear and Mt.Dew slushie machine. Quickie little snow-related comic starring Doc and Snowshoe. Doc, Swampy and the Can opener. The Screenshot from the informal AO "Best PB Comic" poll from Dec, 2002. I got a WACOM pressure-sensitive graphics tablet for just after Thanksgiving '02, and I've been playing around with some of it's capabilities. These two are pure sketch- just scribbles 'til something looked right. The tablet's pen is a cool interface, just flip it over and the system automatically switches to the "eraser" application, just like a real pencil. 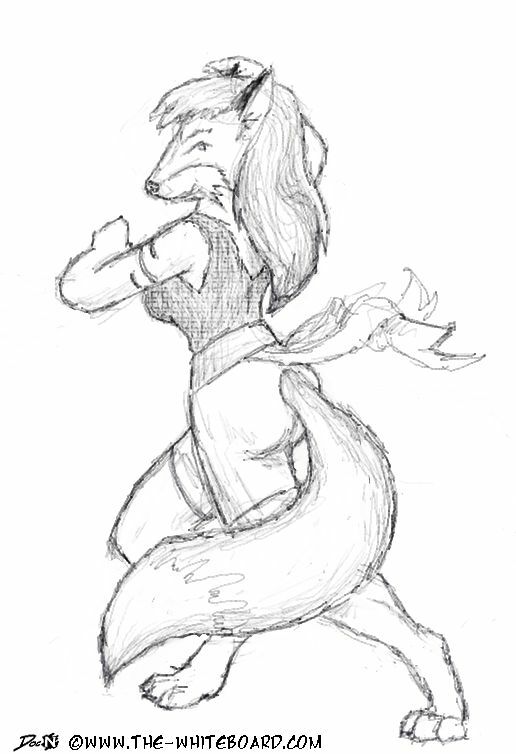 So there was some adjusting and I erased a few totally-wrong lines, but all told, both sketches only took ten or twenty minutes each. "Let me open that for you." 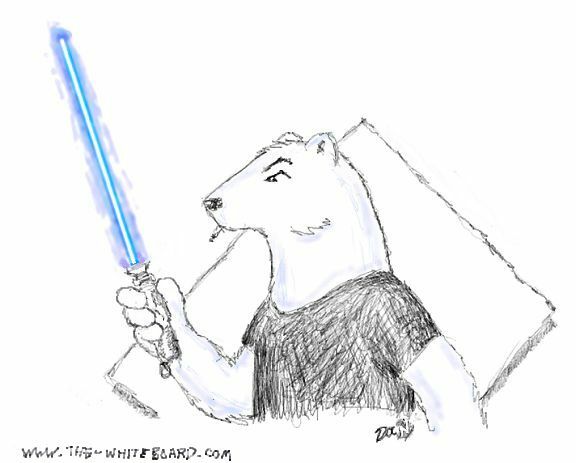 A Polar Bear with a lightsaber?!? And the Fox Chick from the Halloween party. Copyright 2003, 2004, 2005, 2006, Doc's Machine & Airsmith Services. All rights reserved. Unauthorized duplication or distribution of the contained graphics and/or artwork prohibited.